BACKGROUD: Laparoscopic pancreatic surgery still is not a common procedure worldwide and the role of mini-invasive surgery in pancreatic surgery is still being debated. Indication and results are still controversial. Sometimes, due to a thick pancreas, the application of vascular Endo-GIA stapler has been difficult. Also after pancreatic resection, postoperative complications such as a pancreatic leakage cause a serious condition. 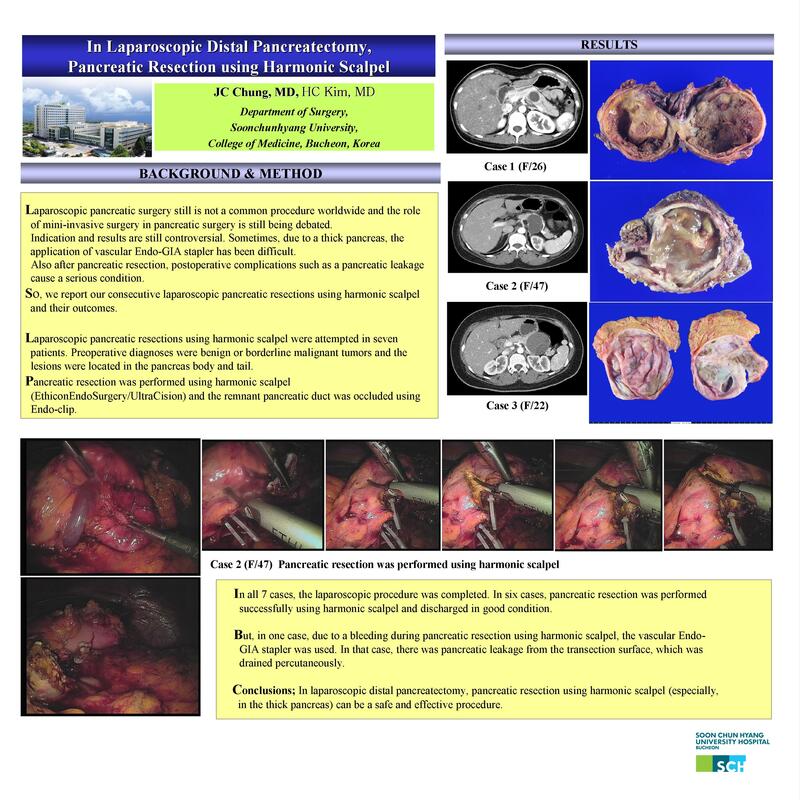 So, we report our consecutive laparoscopic pancreatic resections using harmonic scalpel and their outcomes. METHOD: Laparoscopic pancreatic resections using harmonic scalpel were attempted in seven patients. Preoperative diagnoses were benign or borderline malignant tumors and the lesions were located in the pancreas body and tail. Pancreatic resection was performed using harmonic scalpel (Ethicon EndoSurgery/UltraCision) and the remnant pancreatic duct was occluded using Endo-clip. RESULTS: In all 7 cases, the laparoscopic procedure was completed. In six cases, pancreatic resection was performed successfully using harmonic scalpel and discharged in good condition. But, in one case, due to a bleeding during pancreatic resection using harmonic scalpel, the vascular Endo-GIA stapler was used. In that case, there was pancreatic leakage from the transection surface, which was drained percutaneously. CONCLUSIONS: In the laparoscopic distal pancreatectomy, pancreatic resection using harmonic scalpel (especially, in the thick pancreas) can be a safe and effective procedure.